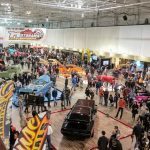 TORONTO, ON • The fifth annual Motorama Custom Car & Motorsports Expo will fill more than 330,000 square feet of Toronto’s International Centre. 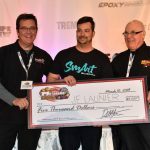 And for the 2019 edition of the Motorama show, the new Rust-Oleum Stage and the adjacent Rust-Oleum Celebrity Autograph Booth will be busy all three days with awards presentations and entertaining and informative activities. 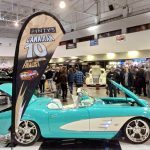 Canada’s largest late-winter celebration of custom vehicles and motorsports takes place March 8, 9 & 10, 2019. Relocated to the southeast corner of the International Centre’s massive Hall 2, the Rust-Oleum Stage will provide the setting for the majority of the show’s awards presentations, celebrity and discussion panels, media announcements and more. Over the years at Motorama, the show’s stage has been the platform for fan interactions with such notables as NASCAR superstars Richard Petty and Bobby Allison, television and automotive celebrities Steve Darnell, Jimmy Shine, Jeff Lutz, Courtney Hansen, Jessi Combs, Twiggy, musician and car collector Billy Gibbons, as well as the legendary Miss Hurst Shifter, Linda Vaughn, and many more. The stage also plays host to the huge Short Track and Drag Racing Night of Champions on the Saturday night of Motorama, an incredible event that honours short track and straight-line racers who won track or series championships the preceding year. And once again, the Rust-Oleum Stage will be ‘the place to be’ for the ‘Automotive Education & Career,’ ‘Meet the Media,’ ‘Short Track Promoters,’ ‘Drag Racing’ and ‘Hot Rod Builders’ panel discussions. The Rust-Oleum Stage will also feature the officials and drivers from the NASCAR Pinty’s Series and the APC Late Model Series, in their own respective sessions. In addition to sponsoring the Rust-Oleum Stage and Celebrity Autograph Booth, Rust-Oleum will also have an exhibitor display where it will showcase many of its automotive-related products and educate showgoers on their uses and applications. 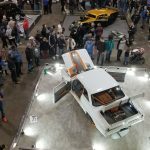 “After a spectacular launch at Motorama 2018, we are very excited to increase our participation for Motorama 2019,” said Kristen Nicol, Senior Brand Manager High Performance Coatings and Automotive – Rust-Oleum Canada. “Motorama is a well-run and well-attended event that lets us talk directly to the consumers and educate them on all the amazing Rustoleum products available at most major retailers. Speaking on behalf of Motorama, Brad Hulton said, “We’re excited and honoured to be working with Rust-Oleum Canada. Their initial experience at the show took place this past March, with an exhibitor booth. And based on their positive experience, they’re transitioning to one of the highest-profile properties at the show to connect with Canadian automotive and racing enthusiasts. The schedule of events for the Rust-Oleum Stage, including times and participants for the Q&As, autographs sessions, media announcements, discussion panels and awards presentations will be published in the weeks leading up to the show and can be found by visiting the show website, www.MotoramaShow.com. ABOUT RUST-OLEUM: Founded in 1921 by sea captain Robert Ferguson, Rust-Oleum has grown into a global manufacturer of innovative paints and coatings, for professionals and consumers. The company offers a wide product range including decorative fashion paints, durable industrial roof repair coatings and, of course, the famous rust-fighting formula that started it all. Headquartered in Vernon Hills, Illinois, the company has offices and factories in 10 countries, including Canada. Rust-Oleum prides itself on having a coating for every application and challenge. For information, visit www.rustoleum.ca.